Photos by Barbara Livingston and Liz Martiniak. ©Barbara Livingston 2003; © all rights reserved. ©Liz Martiniak 2002; © all rights reserved. 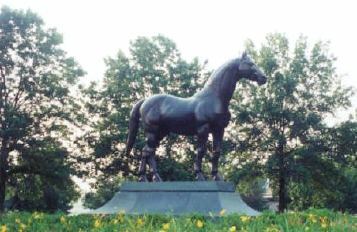 Top: Man o' War's memorial at Kentucky Horse Park (photo by Liz Martiniak). Second row, left: Man o'War's statue with the graves of his sons War Relic and War Admiral at his feet. The KENTUCKY HORSE PARK, a Kentucky State Park on Iron Works Pike north of Lexington, Kentucky, was built in the 1970s. It was created on property once known as Senorita Stud (where Whisk Broom II was born) and later as Walnut Hall Stud, a famed standardbred operation. To add greater appeal to the park as a tourist draw, it was decided, despite some public outcry, to move the famous statue of MAN O'WAR, along with the remains of the famous horse and a select number of others, from the Faraway Farm memorial park on Huffman Mill Pike. MAN O'WAR's owner, Samuel Riddle had given the park to the city of Lexington to make Man o' War's gravesite available in perpetuity to his adoring public. It was felt the move would be in keeping with Riddle's intent. MAN O' WAR, WAR ADMIRAL, WAR RELIC, WAR HAZARD, WAR KILT, and BRUSHUP (dam of WAR ADMIRAL), and the famous statue were all moved to the Horse Park, along with the remains of the great jockey ISAAC MURPHY, where all continue to be popular tourist attractions. Other thoroughbreds buried at the Kentucky Horse Park in various locations include the great French racemare ALLEZ FRANCE, Kentucky Derby winner BOLD FORBES, handicapping legend FOREGO, the top racemare SEFA'S BEAUTY, Aintree Grand National winner JAY TRUMP, and Canadian Triple Crown winner PETESKI. The skeleton of the 19th Century champion and leading sire HANOVER is on display in the Draft Horse Barn. He was initially buried at McGrathiana Stud where he died, and his skeleton was exhumed and given to the University of Kentucky, where it was kept for many years. In the late 1990s, the articulated skeleton was moved to the Kentucky Horse Park. Also located on the Kentucky Horse Park near the Big Barn, is the WALNUT HALL STUD, cemetery, where many top standardbreds are interred. --A.P.